Two years (24 issues) for $95.00. MarineNews, 118 E. 25th St., New York, NY 10010. 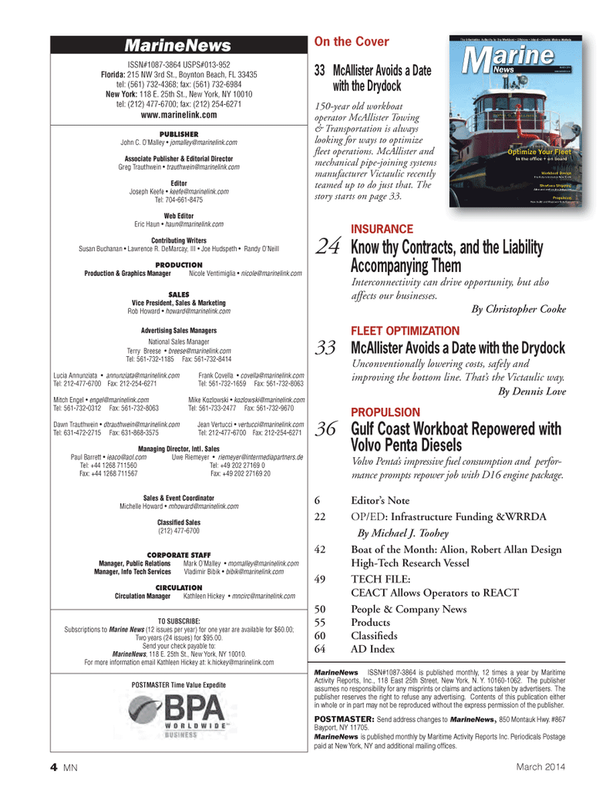 On the Cover 33 McAllister Avoids a Date with the Drydock 150-year old workboat operator McAllister Towing & Transportation is always looking for ways to optimize fl eet operations. McAllister and mechanical pipe-joining systems manufacturer Victaulic recently teamed up to do just that. The story starts on page 33. INSURANCE 24 Know thy Contracts, and the Liability Accompanying Them Interconnectivity can drive opportunity, but also affects our businesses. By Christopher Cooke FLEET OPTIMIZATION 33 McAllister Avoids a Date with the Drydock Unconventionally lowering costs, safely and improving the bottom line. That’s the Victaulic way. Activity Reports, Inc., 118 East 25th Street, New York, N. Y. 10160-1062. The publisher assumes no responsibility for any misprints or claims and actions taken by advertisers. The publisher reserves the right to refuse any advertising. Contents of this publication either in whole or in part may not be reproduced without the express permission of the publisher.